Thank you for choosing Flagship Carpets! We are a family owned and operated business that manufactures in Calhoun Georgia. We combine over 40 years of manufacturing experience. We maintain the most innovative and unique carpet printing machinery in the world. Compared to other suppliers where the product is printed with 256 dpi technology, we manufacture and create our carpets at 625 dpi. For more crisp, detailed images with superior definition and clarity. All 26 letters are represented on this design to provide a unique learning spot for everyone! 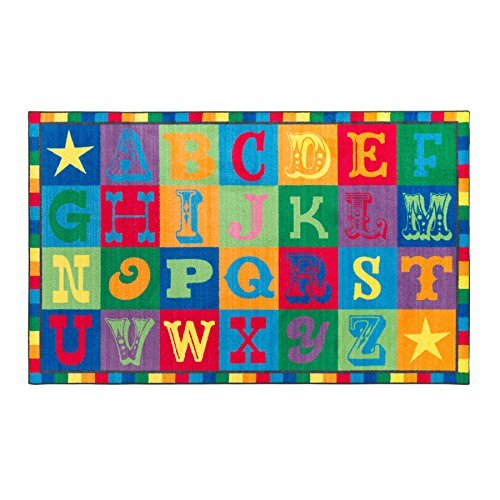 These letters are ideal for teaching letter & Color recognition. Early Blocks will brighten any classroom and because its durability, can also be hung on the wall as a visual aid. TREATMENT: As a part of the manufacturing process, all carpets will be treated with Force 5, a permanent anti-microbial agent. This agent will guard against odor, mildew and mold.